Possum TV: Possums Too Violent for YouTube! Possums Too Violent for YouTube! 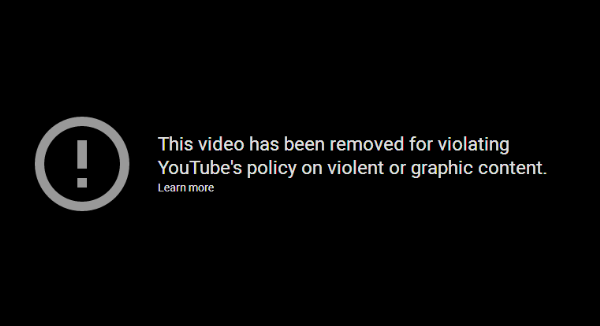 YouTube has deleted my video "Epic Possum Fight: Piranha v Marlon" because they say that it Violates Community Guidelines against Violent and Graphic Content. My YouTube channel now has a "Community Guidelines Strike" against it. This is fairly serious; two more strikes and they permanently delete my channel. BANNED: TOO VIOLENT FOR YOUTUBE! If you want to see this movie, there is a copy downloadable from the main Possum TV site. Please be aware my upload rate is comparatively slow, so it will take some time to download. I agree that, as possums go, Piranha was particularly fierce (hence the name) and his fight against the much larger Marlon - which he won - was violent in the sense that there was a fair amount of scratching and biting and plucking of fur. However at the end, neither possum had any visible injuries. The worst injury sustained was probably to Marlon's pride. I suppose the video might be upsetting to someone who didn't like seeing animals fight, but if you don't like seeing animals fight, you probably shouldn't be watching a video whose title starts with "Epic Possum Fight". As an experiment I typed "Wildlife Documentary" into the YouTube search box and the first video featured - "Best Documentary David Attenborough's - Animals of Africa" - showed a lion taking down and killing a Wildebeest, with hyenas and vultures then shown feasting on its bloody carcass. I would have thought that a video featuring animals killed and torn apart would count as somewhat more "Violent and Graphic", than one in which you don't even see blood drawn and the animals involved walk off having lost no more than a small amount of fur. Seemingly this is the work of some poorly programmed and overly aggressive bot. In my other blog, I wrote about how one should be kind to bots, but here we have a bot which is hopelessly retarded and yet has the capability of inflicting serious damage on its victims. This is a Peter Dutton of bots and it is just detestable, and worthy of condemnation, as its human counterpart. Anyway, I have lodged an appeal and we'll see what happens. agghh. bloody youtube. glad its back up. That seems to be the way these huge corporations go when they achieve a monopoly. They do what they like and are answerable to no-one.